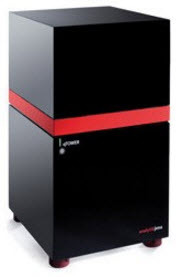 Analytik Jena's qTOWER³ product family guarantees well-founded results for all real-time PCR applications as it benefits from peerless temperature control precision in the sample block regardless of the number of samples used – ranging from 96 up to 384 samples. The patented high-performance fibre-optics guarantee the outstanding homogeneous excitation and illumination of all individual samples. The qTOWER³ product family achieves unique flexibility with its proven filter module equipment, which can be freely configured and expanded at any time, and enables up to six-fold multiplexing. The high-quality sample block stands for optimal thermal conductivity.